Dangerous place, space. Barely a moment went past on Tharsis's mission to Mars that didn't place me firmly into a zone of great danger. See, in Tharsis your mission is to get to Mars or die trying. After your pantry exploded and takes out two of the crew members on your six man mission, the remaining four decide to bunker down and survive. This isn't as easy as it sounds. You're ten weeks away, you're running out of food and worse yet, everything you do depends on a roll of the dice. The dice don't hate you, how could they? But it feels like it every time you fail to pull off even the most simple repairs because you freeze half your dice in "stasis" or have most of them dragged from the table due to the "void". Some of the many mishaps included: too much oxygen, not enough oxygen, an oxygen fire, decompression, vibrations, faults with the piloting computer, food blights… the list went on, and every turn, encompassing a week of the game's disastrous mission, you'll find yourself with two new catastrophes to deal with, ranging from the "actually pretty okay" to the "literally no way I can win this now". As the opening cinematic says: "we were tried for any and all disasters, but not every disaster at once"
That's the game. The same ill-fated mission to Mars again and again and again with the only variable being quite how screwed the game wants you to be. You can try to increase your survival chance by picking which of the different crew-members have survived and while I haven't yet unlocked all of them, they all have valuable skills to bring to the table: The Doctor can heal, the Captain can inspire the rest of the crew and give them extra dice, whereas the Commander can help salvage a bad roll by letting you repair even with a terrible roll. Mechanically it feels like you're playing a boardgame and aesthetically it's not much different, beyond some pretty animations. 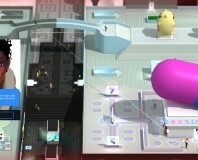 The locations are all viewed top down and the character markers move between them, showing visible stress as you move them around the place, and often mirroring your own attitude as you learn to play. If times are too hard, you can chow down on your dead crewmates, awarding you extra dice if you are willing to forsake your human nature. Why is it every game I enjoy seems to have cannibalism in it? 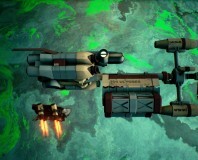 The Long Journey Home is a potentially great space roguelike let down by terrible controls.